Huge tone and power from a head the size of a pedal. 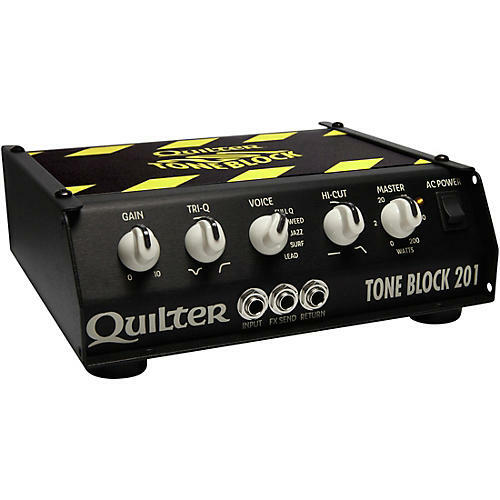 The Quilter Tone Block 201 is the next generation of Quilter Lab's highly vaunted Tone Block 200. It represents the culmination of a guitar head powerful enough to take on even the most heavyweight amp, but light enough and small enough to cozy up on your board with your favorite pedals. With rack mounting options, you can even build the ultimate stereo amplifier for your rack modeling system. With all the tone of Quilter Lab's next generation solid state technology, it is going to feel like you plugged into a tube amp. All analog, no emulation, just amazing tone. Dimensions: 8 3/8 x 3 x 7 1/2 in.